This April marks 50 years since the formation of The Who. On April 17th 1964, they played The Goldhawk Social Club in Shepherd's Bush, where they had gained a loyal following. Photographer David Wedgebury captured these formative moments on camera and shares them in the limited edition MAXIMUM WHO. 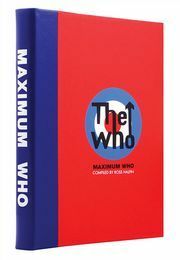 With new original text from Roger Daltrey, John Entwistle and Pete Townshend, this is the definitive documentation of The Who's rise to stardom in the 1960s. To order your copy now, click here.